Amiel Richton is the Imperial Provisional Governor of Stros M'Kai. He resides in the Palace, the former home of Prince A'tor, and is often accompanied by Dram, his bodyguard and loyal servant. Richton is generally disliked by his new subjects, largely because he was responsible for the death of their Prince and the occupation and partial destruction of their city, along with smaller issues like his new taxes and refusal to let almost anyone in the Palace. You first meet him when you enter the Palace to deliver an amulet from N'Gasta. N'Gasta says it is a gift to thank the Governor for his "generous" killing (therefore capturing souls in the necromancer's soul snare) and his policy of not intervening in the necromancer's activities. Richton is quick to dismiss Cyrus as a courier, and is surprised when it turns into a violent confrontation. 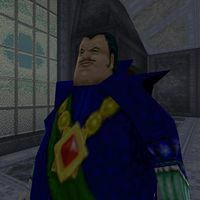 He later appears in several cutscenes, but you do not see him face to face again until the final battle of the game, during the quest Raze the Palace. Cyrus is determined to kill him and take back Stros M'Kai for the Redguards. He is one of your most difficult opponents, with 250 health and attacks that deal 10 damage, or 20 for a less common spin attack. Once his health goes to 0, the final cutscene plays. He feigns surrender, while Dram sneaks up and holds a dagger to Cyrus' throat. What he did not realize is that Cyrus' sword is enchanted with A'tor's soul; the sword rises on its own to strike down both Richton and Dram. Richton's airship crashes to the ground with him aboard. Escape the Catacombs: Find a way out of the Catacombs. N'Gasta's Amulet: Obtain a certain amulet and deliver it to Lord Richton. Richton has various titles, including Admiral, Lord, and Provisional Governor (or Governor for short). He also has a few nicknames among the local populace mocking his weight, such as Fatboy (Prnell and Siona) and Lord Rotund (Dreekius). According to the book The Balladeer's Fakebook added by Morrowind's Entertainers plugin, there is a popular Western drinking song titled Bold Admiral Richton. "I guess, then, it's time!" * Not heard because he does not actually die during combat. This page was last modified on 17 January 2019, at 23:44.